No wonder they were so affable. I am sure we would all be walking with a permanent grin on our faces and a tightly-coiled spring in our step if the collective box-office takings of our movies added up to the gross national product of a medium sized nation. Finding Nemo, the biggest movie of the summer stateside, is the latest gem from Pixar, the company of computer nerds that is now outstripping their parent company Disney, not only technologically but creatively. From their unassailable position atop the family movie tree Lee Unkrich and Andrew Stanton, the film’s co-directors, took time away from their desktops to explain the realisation of a movie so rich in texture and, perhaps unexpectedly, animated tradition. Pixar’s biggest asset may not in fact be their implementation of a revolutionary new device (in the form of computer-generated imagery) for making feature-length cartoons, but in their reliance on the tried and tested cornerstones of animated storytelling. Question: Why the dark element at the beginning of Finding Nemo? Andrew Stanton: It wasn’t intentional, when I first wrote the picture it was just alluded to very cinematically with little pulsing images, it was originally set as the father Marlin laying awake at night being very nervous. You didn’t know what it was about but you knew something was disturbing him. We would then piece back in flashback what you now see at the start of the movie. From a structural standpoint it was very engaging, but one of the problems this created was that you were having no real allegiance to the father at the beginning because his nervousness was annoying and off-putting. And he (pointing to Lee Unkrich) kept going “put it all at the beginning, don’t tell it in flashback” and I kept ignoring that, and then finally we thought, just try it. Lee Unkrich: It wasn’t really to fix Marlin the father; it was just to make the movie play a little better. Andrew Stanton: After that it was about being dark, because it has to be dark, but being responsible with it. One of the nice by-products of it was it told the audience right of the bat that these are the rules of the world and the rules of nature. It is a predatory world and everything is out there to get you. Question: The film’s taken over 330 million dollar in the US alone, have you both been surprised at the success the movie has enjoyed? Andrew Stanton: Surprised is an understatement. Nobody sets out to do something like that, we just tried to keep our head above water and make a movie worthy of the other ones we have made. That is pretty much all that is haunting you when you are making it in isolation up in San Francisco. Lee Unkrich: What you have to realise is that when Finding Nemo came out we were looking at The Matrix Reloaded coming out two weeks before and The Hulk coming out two weeks after. Andrew Stanton: We just saw these titans and we thought if we could just hold out for one weekend we would have been happy. Lee Unkrich: Somehow we ended up being like this little nimble fish that managed to swim through the waters of the summer and getting past all these other movies that were coming out. Andrew Stanton: it’s really heartening because I honestly thought the movie would have a smaller audience because I knew I was going for little bit more drama, less comedy and a little more emotion and darkness. This was intentional, it was something I was dying to try within the repertoire of our movies and I assumed that would narrow the audience. Lee Unkrich: He actually used to apologise to me all the time saying that he felt so bad for being remembered as the director who made the first Pixar film that wasn’t a big hit! Andrew Stanton: It was like a big hot potato that we would throw around. Like: Now it’s your turn! Question: You mentioned your other films; did you feel under any pressure to top those that came before? Andrew Stanton: Well not to top because there certainly isn’t any competition in that sense because we’re all in it together no matter who makes the movie, and you want them all to succeed but yeah there’s definite pressure. The thing is, all of our movies have had that sense of pressure. With Toy Story it was a case of can you even make that kind of movie at all. People didn’t think you could sit through a fully CG movie. That was the most common question we used to face from the press when the movie was coming out and it’s funny because that question has never come back ever since then. Lee Unkrich: We’re never thinking “oh we need to make as much money as Monsters Inc made” for example, we’re just trying to make a movie that can live up to the expectations that people have because of the previous films. Andrew Stanton: Toy Story was made in complete ignorance of marketing or box-office and we found that there’s something to that so we truly just try to block out the world and make what we would make for ourselves, because somehow that was the mojo that got you Toy Story. Question: How long did it take you to cast Finding Nemo? Andrew Stanton: Not that long. We always have our wish list and by film five people actually start to return your phone calls. It was great, it would be like: “We’d love so and so” and the reply would be: “They’d love to do it”. Pretty much everybody in Nemo was our first choice. We realise it’s a pretty eclectic mix but people must understand that from a live action standpoint when there’s an actor that has something special the camera just loves them, they just stand there and there’s an extra, star quality about them. Lee Unkrich: you’d be surprised, we’ve listened to a lot of A-list movie stars over the years and with some of them the moment you take away the visual persona there’s nothing there anymore. But conversely there are other actors who deliver such a special something just with their voices. Question: You two sit in a dark room then and just listen to people talk? Andrew Stanton: Yeah. We have our own private casting call without the actors even being there, like our version of the casting couch. We sit there and decide that so and so would be good and we’ll then take 3 or 4 of their best movies, usually movies that cover their range and take soundbites from the movie and put those audio clips next to the designs for the character. We’ll then watch it and then if we really like that person we’ll begin to animate the character. Lee Unkrich: We animated to Turner and Hooch for Tom Hanks on Toy Story. It’s great for us to just see how it may turn out, but it’s also a great selling tool because when you go to the actor with this piece of material that is already animated with their voice coming out of it. Question (from Future Movies! ): When you came up with the original concept did you visualise it as a Computer-generated movie or do you think of it in more realistic terms in the first instance? Andrew Stanton: It’s weird, I always feel like I want to say yes and no to that answer. The artist in me wants to say no, I just do whatever will be the most exciting thing because you don’t want to place any worldly constraints on the story you want to tell. On the other hand you don’t want to randomly pick just any story and then say we can make this into a CGI movie because I think you are not thinking specifically enough about which stories will work well digitally. Finding Nemo is a perfect example of this. I knew the environment before I knew the story. I just knew that water could be capitalised and portrayed accurately in a way that you couldn’t do with any other media; that you could truly give a sense of what it’s like to be under water. I had that instinct in 1992 and I sat on it until I had a story that I felt was worthy of being told in that environment. So the CGI aspect was very much considered but only as an asset not as a limitation. Question: What do you feel was your biggest challenge on this film specifically? Question: Didn’t they say that about hair though? Lee Unkrich: Well, yes that was another one! Anything that’s organic or changing shape from frame to frame is difficult to get just right, and water is very, very difficult. We did a lot of work to replicate the movement of water and get the physics right for some of the shots in the movie, for example where the waves are crashing or when the whale’s tail lifts out of the water and makes a big splash. That stuff was really hard to do. Andrew Stanton: They would be what you might call “money shots”. Lee Unkrich: But if you count all of those types of shots in the movie there are really only a handful of them, but there are a lot of shots where we’re down below in the void and you can’t see the surface of the water. These shots turned out to be an artistic choice rather than a technical challenge. It was all about how we could best create the illusion of being under water with the fish. We largely achieved this by studying a lot of underwater footage from documentaries and the like and we broke down all the elements. We figured out all the little things that gave the illusion of being under the water; all the little particles floating around; how the light comes down from the surface; the way colour behaves under water. We basically created a list of these elements and figured out the best way to combine them. We also found that some simple animation techniques cemented the illusion. We gave the impression that there was a constant underwater current by letting the animators make their characters drift a little bit in the frame, it’s little things like this which make you really feel like you are down there when you’re watching the movie. Andrew Stanton: It was the most excited I have ever seen our technical crew because they really felt like moviemakers. It reminded me of seeing some matte paintings from old Hitchcock movies in an exhibition when I was younger. Although the paintings didn’t really look that real up close, somehow when it was done just right you felt like you were in the sets that weren’t there. That whole movie-magic thing is fascinating and to have to think like that on this project made everyone believe they were actually in the movie making business as opposed to the technical business. Lee Unkrich: totally, because we were doing this really hi-tech movie but a lot of the techniques we used were the same as those people were using almost a century ago; just a simple layering of elements to create an illusion. Andrew Stanton: No, it was always Australia purely because of my laziness. When I started to write I knew nothing about fish. I knew I had a lot of research to do, and I just wanted to set the thing in some western culture where I have some semblance of how the society works without learning about another culture. With coral reefs being pretty few and far between in a western setting, it was either going to be Florida or the Great Barrier Reef to Sydney, and after a moments thought it became Australia. The Great Barrier Reef truly carries every single element that I wanted in the movie; every kind of setting and species, also Sydney harbour has become more and more iconic so it really became a no-brainer to set it there. Lee Unkrich: also we thought we would get a free trip out of it, which we did! Question: I read somewhere that you used Bambi as inspiration for the movements of the animals, is that true? Andrew Stanton: Yes, but I don’t want to give the sense that anytime we make a movie we have to look at another animated movie. However, Bambi sticks out because they actually stuck to the rules of nature; displaying exactly how forest life has to survive. At the same time, the animators created the impression that these animals could walk and talk and gesture just like us, when they really weren’t; they always walk and talk like a deer or acting like a rabbit and there was always this great balance where you almost felt like you knew what it was like to be an animal in that environment. I wanted to create exactly that kind of feel underwater. Question: What is the central message you would like the film to communicate to the public? Andrew Stanton: I just hope they enjoyed it and will want to go to the movies again. That is the only reason I keep going to the movies to see so many bad films, and feeling like I want my two hours back. Lee Unkrich: I think that’s why we work so hard on these things because we get precious little time to go to see movies and so many times we go to see one and it’s just awful. Andrew Stanton: Whenever I get the chance to meet a great filmmaker who has influenced me at any time in my life I just really want to thank them, because they contributed to my desire to get into this business and my drive to keep putting up with all the crap that you have to suffer to make these movies. The biggest compliment you could ever get is that someone went to see your movie and felt the same way, or was inspired to go and make movies. Question: Do you have any favourite characters in Finding Nemo? Lee Unkrich: That’s like asking us to pick our favourite kids! Andrew Stanton: I have an affinity for the seagulls because I grew up with them and I always hated them and I feel that their personification in this movie is so exactly what that species is about. 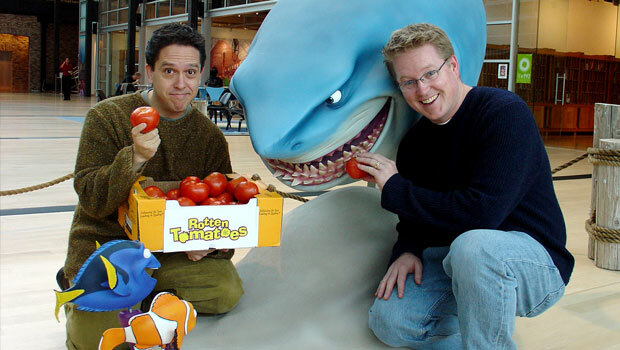 Lee Unkrich: I think Dorrie is really great. I remember when Andrew wrote his first draft of the script she was already such a fully-realised character, so much more so than in any other film we’ve made. A lot of the time when we make movies the characters kind of find themselves in development, and the actor will often bring a lot to proceedings. But Andrew wrote Dorrie for Ellen DeGeneres and instantly it was a character I really wanted to see onscreen. When I watch the finished film I realised that she is one of the best characters we’ve had in any of our films. Andrew Stanton: I based it on Ellen loosely, I didn’t know her, but I was influenced by many of her mannerisms. I was actually having difficulties solving the problem with the character. I knew that I needed her to help the father get all the way through the ocean and then I read a fact somewhere that Goldfish only have a memory of three seconds. I thought that was perfect for the story; I had the problem of a parent and a child who have to grow as the story develops without each other. What I really needed to do was create surrogate versions of each other. So combining Marlin with a character that can only remember every fifteen seconds you’re basically saddled with a child. I had seen Ellen performing on her show where she changed the TV set five times in one show in such a way that was Ellen and I thought it was perfect, and solved the problem of the one-trick gag that we were all worried about. It was such a muse and I did exactly what you’re not supposed to do which is write a part for her without any guarantees that she would be able to do it. Question: Did you allow her any improvisation? Andrew Stanton: No, most of it was written. We would always encourage her to improvise but we would always make them get on tape what we’d written than allow room after to try other things. What you see therefore is about 20-30% her; either stuff that she has just come up with on the fly, or evolved from what we had. Lee Unkrich: Some of the actors like to stay true to the text and not stray too far away from it. But then you’ll get somebody like Albert Brooks who will spend half an hour on a line and he’ll give you a hundred different variations on it. It’s amazing. Andrew Stanton: well, a lot of that is because of the media, because humans are hard to do. Lee Unkrich: Although that’s what we’re doing for our next movie. Andrew Stanton: Yeah, but we’re just going for a very caricatured style as opposed to mimic exactly what we look like because the reason it’s so hard to design a human in CGI is because we are all authorities. We look in the mirror everyday and if something is off you’ll know right away. Lee Unkrich: It’s like the closer to getting it perfectly right the more you notice the flaws. To us it’s an intellectual exercise as much as anything else to try and create a digital human, it’s nothing we’re really interested in doing. We just want to tell stories and if there happens to be people in it then we are going to stylise them as much as possible so we don’t have to worry about achieving perfection. The last thing we want is for people to be thrown out of the picture as they are watching it by some stupid, odd thing. Question (from Future Movies): Flipping that on it’s head, do you not think the beauty of animation is that fact that you can let your imagination run wild with no real debt to pay to reality? Andrew Stanton: I do think that’s the beauty of animation, and specifically computer graphics because you are able to realise worlds that you have imagined forever as a child. All I have ever known is to ask “What if?” and there is something about CGI that realises things so accurately and so dimensionally. Lee Unkrich: It messes with your mind because you know on one level that what you’re seeing is not really real but it looks so real. There are times that you are convinced you’re watching puppets or live action. We had a lot of reaction to Nemo where people thought we had actually shot live action footage of the ocean and then just superimposed the animation over it. Ever since the first Toy Story that has been the attraction, to create this constant tugging in the brain. Andrew Stanton: One of the real beauties of computer graphics is that it fits accurately a fully-visualised world to how you imagined it in your mind’s eye, you can feel like you are finally starting to check some things off on your imagination list. Question: So after working on the film for so long do you now appeal to Bruce’s ethos that fish are friends and not food? Lee Unkrich: Well we spent the entire movie wondering if they would serve sushi at our wrap party and they did! We still eat fish.